This is a comprehensive course intended for candidates aspiring for a position in the Surveying industry. The course covers all aspects of surveying including new technologies and hands-on training and expertise in state-of-the-art survey equipment and gadgets. This is a Crash Programme where all the portions of Levels 1 to 4 are covered in a shortened time-frame. 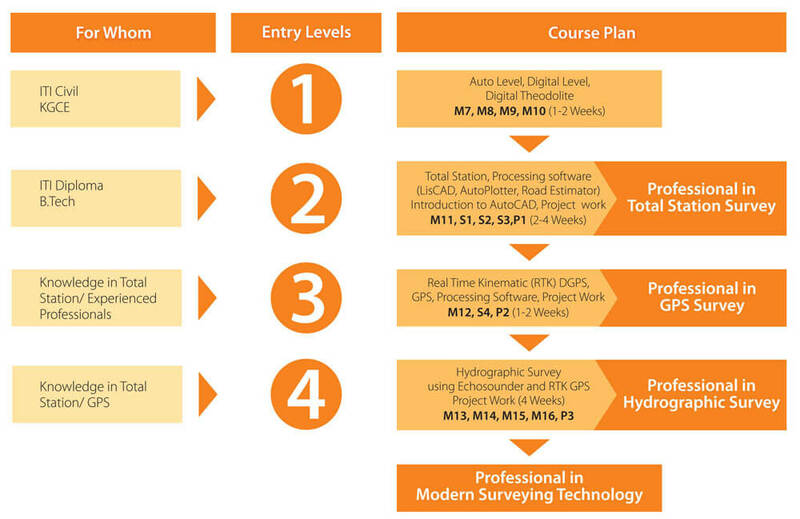 In a matter of three to four months, an undergraduate student without any technical background is trained in Geoinformatics (from fundamentals to the most advanced Total Station & Real Time Kinematic DGPS Survey) and Hydrographic Survey to become a competent survey professional. It is imperative that students who opt for this programme should be totally committed and willing to put in extra hours of study as well as be prompt in submitting assignments and project work.